Sam has a new jacket for S6 – and just like Dean’s new brown coat, this one has a nice corduroy collar that’s a little darker blue than the coat. It does up with a zipper and has no breast pockets. Brand Information: Carhartt Western Bomber. In Exile on Main St. (6x01), Sam wears it when he rescues Dean, but is not wearing it when Dean wakes up and they talk. He puts it on again to take Dean home to check on Lisa and Ben and then keeps it on for the rest of the episode. 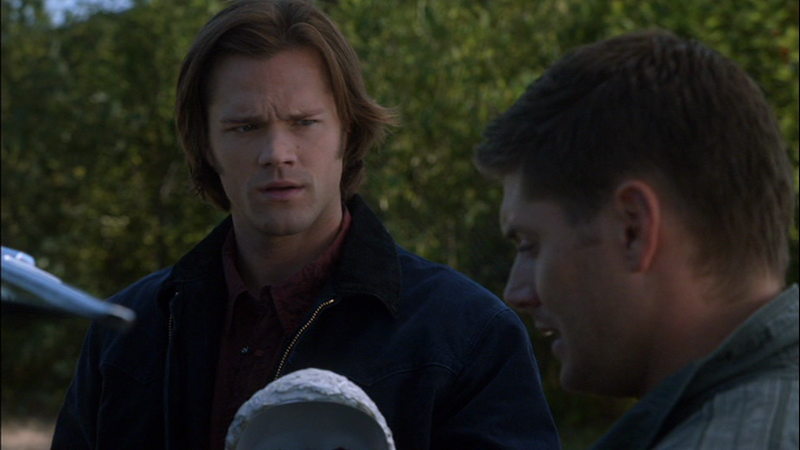 In The Third Man (6x03), Sam wears it when he is talking to Dean next to the Impala at the end of the episode. In Unforgiven (6x13), Sam wears this coat when he goes to see Brenna Dobbs after she lets him out of jail. He wears the coat every time he is not at the abandoned house with Dean for the rest of the episode, except for the very last scene where he and Dean are packing up to leave. In Mannequin 3: The Reckoning (6x14), since we pick up where we left off, Sam is still wearing this coat as he comes to, and he and Dean leave town, stop for food, and Dean finds their next job. He then switches to a different coat. In ...And Then There Were None (6x16), Sam wears this coat to the cannery to hunt the monster. In The Man Who Would Be King (6x20), Sam wears this coat the entire time the Winchesters are at Elsworth’s empty house. In Slash Fiction (7x06), Sam wears this coat when he and Dean travel to meet Frank. He keeps it on until the leviathan doppelgangers are dispatched. In How To Win Friends and Influence Monsters (7x09), Sam wears this coat at the beginning of the episode when they arrive at the abandoned house and go over the potential case with Bobby. In Adventures in Babysitting (7x11), Sam is wearing this coat when he arrives at Crissy’s place to see what is wrong. He isn’t wearing it when he leaves a message on Dean’s phone, but otherwise he keeps it on until Dean and Crissy rescue him from the Vitalas. In Party On, Garth (7x18), Sam wears it the entire episode, except when he is in a suit and when we first see him in the motel room as Garth is fixing his EMF meter and Sam is finding information on the shojo. In There Will Be Blood (7x22), Sam wears this coat when they travel to Hoople, North Dakota, in the hopes of finding the alpha vampire. He wears it for the remainder of the episode. Sam continues to wear this coat in Survival of the Fittest (7x23). He wears it whenever he is not inside Rufus’ cabin. In Blood Brother (8x05), Sam is wearing this coast at the beginning of the episode, when he and Dean arrive at the motel. He takes it off while Dean is outside on the phone. He only puts back on again when he drives out to find Dean after Dean calls him and admits that he’s in a vampires nest. In Citizen Fang (8x09), Sam wears it for the entire episode, except for flashbacks, when he is in Martin’s hotel room after Dean returns from seeing Benny, and inside the bar in Kermit, TX, at the very end of the episode. In Torn and Frayed (8x10), Sam wears this coat when he goes to the park to sit on a bench and think about his life...which is where Castiel finds him and recruits him to help find Samandriel. Sam leaves the coat on until Cas returns to heaven. In Man’s Best Friend With Benefits (8x15), Sam wears this coat for the entire episode, except when he’s hanging out in the motel room. In Taxi Driver (8x19), Sam wears this coat for the entire episode. In Clip Show (8x22), Sam wears this coat whenever he is not in the bunker. In Rock and a Hard Place (9x08), Sam wears this coat when he and Dean investigate the church that the victims all had in common. He takes it off for his meeting with the chastity group and whenever he is in the motel room. In The Purge (9x13), Sam wears this coat briefly when he and Dean are wrapping things up at Canyon Valley after having successfully killed the monster. 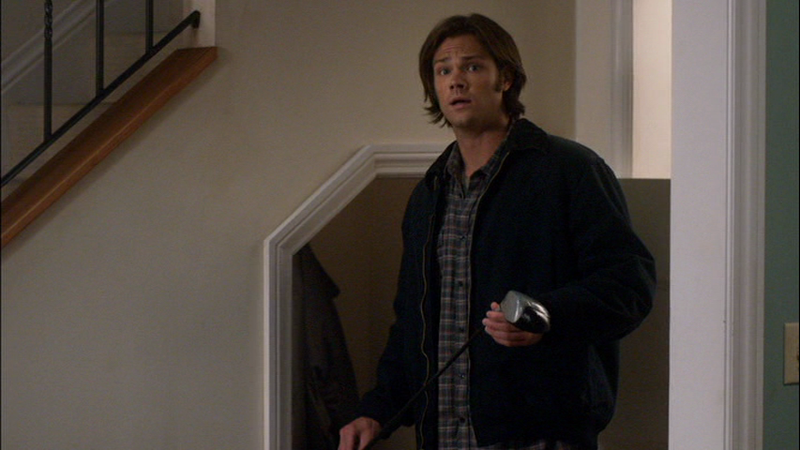 In Mother’s Little Helper (9x17), Sam wears this coat anytime he is not in a suit. In Paint It Black (10x16), Sam wears this coat whenever he is not in a suit. In The Prisoner (10x22), Sam wears this from after Charlie’s funeral until the end of the episode. In Love Hurts (11x13), this coat is hanging on the back of the motel chair, after Sam and Dean have changed out of their suits and Melissa arrives at their motel room in a panic. Sam grabs it on his way out the door after the Qareen attacks. He waits until Dean pulls the Impala over at the side of the road before he puts it on, however. He then wears it for the rest of the episode. Could be! Only time will tell if the Superhero Hoodie ever makes a reappearance.